"If I'm too old for this, then I got nothing. That enough truth to suit you?" Some people might not have been terribly surprised when Clint Eastwood won a Best Picture Oscar for Unforgiven, considering the long experience he had in the Western genre. Fans of Eastwood of course know that he's capable of much more than that as a director, given the wide variety of pictures that he has made successfully. 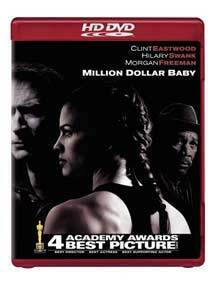 Any doubts were put to rest once and for all when he took another Best Picture and Best Director Oscar for this 2004 tale of heart and determination in and out of the boxing ring. Eastwood stars as Frankie Dunn, a boxing trainer and manager of the Hit Pit Gym, with his sidekick and former fighter the now one-eyed Scrap Iron (Morgan Freeman). Frankie's star fighter, Big Willie Jones (Mike Colter) is on his way to a title fight when he abruptly decides to change managers, leaving Frankie doubting himself. Female fighter Maggie Fitzgerald (Hilary Swank) approaches Dunn about training her, but he refuses, saying he doesn't train girls. But Maggie is persistent and eventually wins him over, aiming to make a career as a professional boxer, even though Frankie thinks she's over the hill. The lead actors are marvelous (Swank also won a Best Actress Oscar while Freeman scored one as Best Supporting Actor), much deserving the plaudits they have received. Eastwood gives Frankie a tough shell that is full of self-doubt, ladled with unhappiness over his estrangement from his daughter, tentatively replacing her with surrogate daughter Maggie. Swank is utterly convincing as a self-described piece of white trash from Missouri, both proud and ashamed at the same time, reveling in the idea that she can be something more in the boxing ring. She gives the character plenty of depth and reality, obnoxious and appealing at once. Freeman is drily laconic as the washed-up fighter reduced to cleaning up the spit and sweat of younger men who still have hope, but he also has a wisdom and clarity (helped to some extent by getting the voiceover role). There's plenty of pathos generated by the characters. One of the most affecting sequences comes when Maggie buys her mother Earline (Margo Martindale) a house with her prize money, only to find mother and sister Mardell (Riki Lindhome) distinctly unappreciative. Maggie's painful transition from happiness to depression is particularly moving as the family first disdains the gift and then assumes airs of smug superiority over her. A subplot involving a mentally deficient hanger-on who calls himself Danger (Jay Baruchel) also manages to tug at the heartstrings as the other boxers mock him and eventually get him into a fight way over his head. And of course, there's the tragic final act of the film, which takes on some areas of controversy touching on issues of quality of life still aflame in America. While that ending has provided much of the spark that has made the film a subject of discussion, it's really a fairly minor part of the story, which is focused on hope and love of life. Family ties are one of the most important elements of the picture, even if artificial families such as that of the three leads prove to be more resilient than those of blood. Nonetheless, Maggie's fighting motto, mo cuishle, ties in to both blood and family as she ascends to the top of her sport. Even though Maggie and Frankie's blood families don't have any use for them, both of these leads have deep affection for their blood relations, one-sided as the relationship might be. At the same time, Frankie is unsure of how to deal with his artificial families, based on his experience. He blames himself for failing to protect Scrap Iron, resulting in the loss of his eye, and is too protective of Big Willie Jones to let him take on the title fight and ends up forcing Willie's betrayal. Torn between the two extremes, he alternates between overprotecting Maggie and turning a laissez-faire attitude towards her. The relationships are complicated and their resolutions are painful, but they make a picture that is not easily forgotten. Image Transfer Review: The HD transfer is quite attractive, with textures and fine detail given brilliant attention. No compression artifacts of any kind were noted. Color is vivid, blacks are deep and shadow detail is quite excellent. By comparison, the standard DVD looks rather muddy and lacking in clarity. Audio Transfer Review: Both English and French Dolby Digital Plus 5.1 tracks are included. The sound is crisp and clean, with little to complain about. The dialogue is pretty well center-oriented, with the surrounds used for crowd noises and sound effects. It's a fairly subtle mix but quite effective for the film; this isn't an action extravaganza that calls for a lot of LFE or vivid surround placement. As is the case with the other Warner titles in the first wave of HD-DVD, the sound through the optical and coaxial outputs is about 10 db low; after correcting for volume levels it sounds fine. As is the case with the video, the grade reflects what we expect will be a learning experience. Extras Review: The extras on the HD-DVD disc are identical with those on the standard version. Other than an anamorphic theatrical trailer, all are presented in nonanamorphic widescreen 480i, so they're certainly not taking full advantage of the format. There are two documentaries and a featurette. The first (24m:44s) and last (13m:03s) are worthwhile discussions with the stars and the producers, recounting the history and background of the film. They're well worth watching. Less interesting is Born to Fight (19m:11s), which takes a look at women's boxing but almost entirely through the prism of the film, with substantial clips. The only segment of interest is that featuring Lucia Rijker, a real-life boxer who plays the German champion, Billie the Blue Bear, who gives a brief insight into the sport. Otherwise, that documentary is dispensable. One of the best boxing dramas of all time, with some good extra materials and a sparkling HD transfer that reveals plenty of detail.